Tuff Trays > Square Stone Resin Shower Tray & Waste 900x900mm (Low Profile). 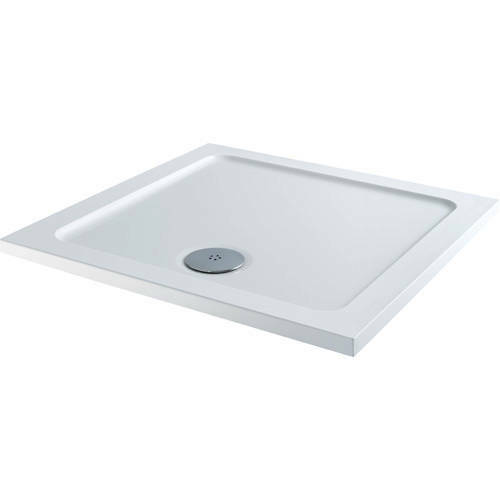 Tuff Trays square low profile stone resin shower tray in white finish (900x900mm). Low profile design with flat top. Strong Stone Resin construction and then ABS capped. Due to the combination of these materials, acrylic capped ABS shower trays are generally much more reliable and a higher quality than other shower trays. Can be installed direct on a floor, level with a floor or with leg (sold separately). Size: 900W x 900D mm. Tuff Trays have been manufactured using the highest standards and the latest in digital technology. Built to last these shower trays have been constructed from strong ABS capped Stone Resin. Suitable for domestic and commercial applications they are a favourite with UK and European architects. Tuff Trays are easy to install and have a flat underside for fast leveling. They will last a lifetime and we recommend the use of a Stone Resin shower trays above all others in a new enclosure installation.